Another roadumentary is on the way. We have documented a lot of happenings and opportunities along the roads from Rovaniemi, Finland to Nordkapp and Piteå, Sweden to Nordkapp. The third road is perhaps the longest in kilometers per latitude. The main road along the coast of Norway ending at Nordkapp is spiraling through one scenic fjord after another. The starting point has been set at Steinkjer, well below the Arctic Circle. 7 kilometers north of Steinkjer, at Asp, travelers have two alternative touristic roads to choose from when driving towards Bodø/Tverlandet/Fauske. The road less driven is Fv17, Kystriksveien. The road along the coast of Helgeland includes Namsos, Brønnøysund, Sandnessjøen, Nesna and Saltstraumen. The road most people travel is the E6 passing Mosjøen, Mo i Rana and Saltfjellet. This road Steinkjer – Mo i Rana – Fauske – Narvik – Alta – Olderfjord – Nordkapp is the Arctic Fjord Road. Most of it is along E6. The last 129 kilometer stretch between Olderfjord and Nordkapp is E69. Included in the Arctic Fjord Road are “detours” to significant destinations such as Tjøtta, Bodø, Tromsø, Jøkelfjord, Hammerfest and Havøysund. Tjøtta is the burial site of Russian and other international soldiers who died on Norwegian soil during World War II. Tjøtta is 84 km west of E6. Jøkelfjord is perhaps the most exotic natural destination of all along the Arctic Fjord Road. Some destinations are already documented as part of the Midnight Sun Road or Santa’s Road. 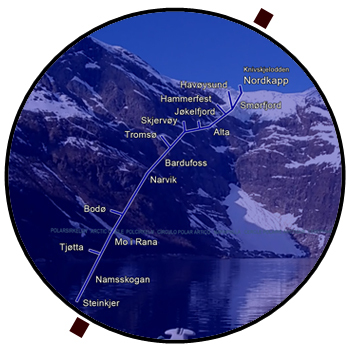 In particular, Nordkapp as a municipality and Alta have been explored in greater detail. More details and better graphics will be added when more information is ready.